My favorite breakfast (or lunch) as of late. It’s so quick to whip up and that’s good with the baby around. This is based on Ina Garten’s slow-cooked scrambled eggs that I saw on Food Network. I love Food Network and use it as white noise during the day. E used to nap in the living room and would wake up to every little noise if it’s dead quiet. And for me, too – when it’s dead quiet, I go a little crazy. George doesn’t get my fascination with cooking and food shows and can be seen shaking his head when I have them on. George: When you’re not eating, you’re watching shows about food and eating. What can I say? Food makes me happy. I was pretty upset when I was pregnant and couldn’t eat. My stomach felt like it was the size of a tennis ball and even food that I normally enjoyed I couldn’t stand. I ended up losing almost 20 lbs from my pre-pregnancy weight. No worries, though, I’m making up for lost time. After giving birth, it was like, “Oh my god! Food never tasted so good.” And breastfeeding made me SO HUNGRY. It was great to have an excuse to eat all the time. Even my OB said at post partum checkup to “go ahead and have that ice cream.” I wanted to hug her. 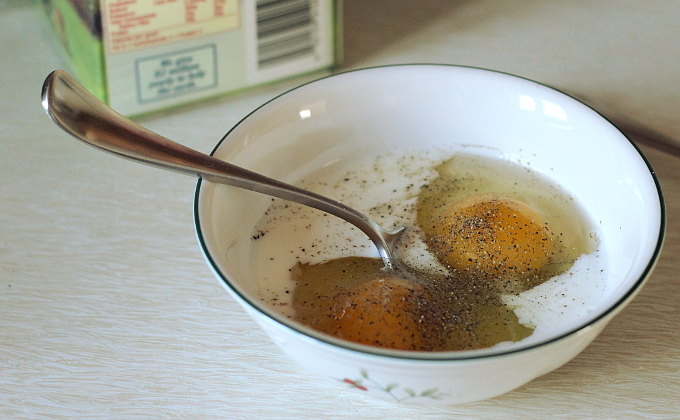 – Beat eggs in a bowl with milk, salt, and pepper. – Heat a pat of butter in a pan over medium heat. Add the eggs and stir constantly until desired doneness. 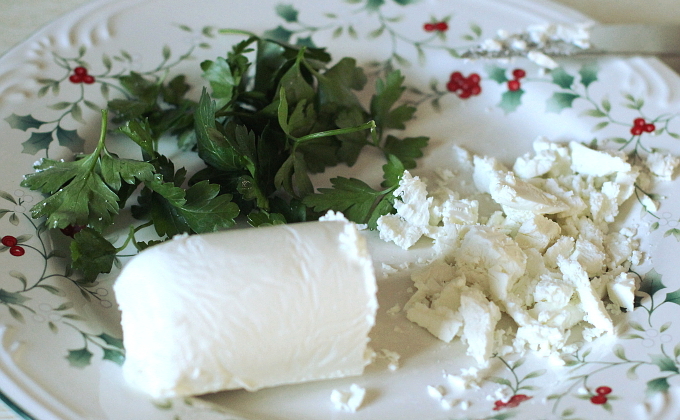 – Stir in the herbs and goat cheese until cheese is melted. 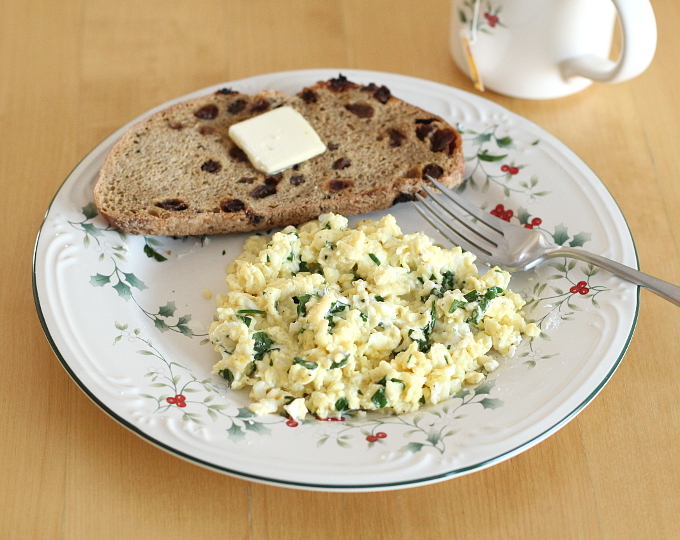 4 Comments for "Goat Cheese and Herb Scrambled Eggs"
This post made me hungry too. Seems that you’ve fully adjusted to NH living huh — baby, hubby and all? Will definitely try this recipe as soon as I get the chance. Thanks. Thanks! We celebrated quietly at home. My only request was a cake and George obliged. Mmm, sounds delicious. I know what you mean about not being able to eat much when you were pregnant, I forgot what it was like not to feel sick all the time. Yay for breastfeeding though, and the excuse to eat everything!